Kutná Hora  is a town in the Central Bohemia region of the Czech Republic. Kutná Hora was a silver mining town in medieval times: once the second Czech city to Prague in terms of population. Today it is home to about 21000 people. Although Kutná Hora has some comparatively drab modern architecture, it was enscribed on the UNESCO World Heritage List in 1995 for the Historical Town Centre, including the Church of St Barbara and the Cathedral of Our Lady at Sedlec. At both ends of the town there are some beautiful buildings, and the higher points of the town are home to restored older architecture, with Medieval, Gothic, Renaissance and Baroque buildings. There are trains roughly hourly from Prague leaving Hlavní nádraží, see the time schedule. Kutná Hora město station is closer to the town, but Kutná Hora hl.n. is a 10 minute walk from the Ossuary. A single train ticket is CZK 104 (for two or more people, a group rate, "skupinová sleva", is available, second person pays CZK 73, each extra person pays CZK 52). Journey time is usually 1 hour 12 minutes. There are buses roughly hourly from Prague leaving the Florenc or Háje bus station, see the time schedule. Some are direct and some require an interchange. The fare is around CZK 70. Journey time is usually 1 hour 40 minutes. The town is about three kilometers in length, so it is possible to explore Kutná Hora on foot. This isn't particularly rewarding though, as most of it is residential and the attractions (with the exception of the Kostnice Ossuary) are concentrated at the other end of town from the train station. There is a local bus system with buses arriving to meet the trains. If you want to return to the train station from the historical core, take the bus that says "Hlavni Nádraží" on the front window. A single ride for adults costs 12 crowns and will leave you right at the train station, though the schedule only has two buses an hour, so walking might actually be quicker depending on your timing. There is also a very convenient, privately operated "tourist bus" that constantly drives between the main train station (Hl. N), the ossuary, and St. Barbara for 35CZK per person. The drivers wait until the bus (which is really a mini van) fills up to at least 3 guests, then drives off. He's usually waiting outside the Ossuary, driving people to the St. Barbara Church. There is also local train connecting historical core (station "Kutná Hora město") and the main station "Kutná Hora hlavní nádraží". It meets the arrival (and departure) of nearly all the express trains, leaving a five-minute gap for transfer. (This could be a problem if you want to leave luggage at the main station, since (1) there are no left luggage facilities at the local station and (2) if you see both the Ossuary and the city, then it may be convenient to arrive at one station and leave from the other.) You can buy the train ticket from the local station "Kutná Hora město" directly to Prague. The price will be about the same as the price from "Kutná Hora hlavní nádraží" to Prague. This isn't Prague, though, so expect only minimal understanding of non-Czech languages from the ticket sellers. There are no ticket machines or similar amenities. There are also taxis: usually one or two will meet the train, otherwise they can be a little difficult to find. Unlike in Prague, it is safe to hail them in the street: they won't overcharge. A taxi ride from one end of town to the other is about 80 Kč. When you arrive at Kutná Hora you may get the Number 1 bus to Kutná Hora Město (Kutná Hora Town Center) or wait at the station for the train that goes to Kutná Hora Město. There are 3 stops, but you're better off at Kutná Hora Mešto if you're headed to the town center and not the Ossuary. Then, walking is your best bet. When you leave the station, go right until you reach the first intersection (about 3min walk). Then turn left and walk for another 5-8 minutes (it depends on how quickly you walk) and you will come to the church on your left (more details to follow) and the Ossuary on your right. At the Ossuary you need to pay a fee to enter (50Kč) and another one to take pictures (30 Kč). After you finish with the Ossuary, you can walk to the town center but it will take 35-45 minutes. Go back to the main road and turn right. You're now about 2,5km from the town center. All you have to do is to follow the road signs until you reach the main attractions in the town center. You cannot miss the St. Barbara's Cathedral and, April to November, the Hrádek - Czech museum of silver. Suggested Itinerary Arrive at the Kutna Hora Hlavni Nádraží, walk to the Ossuary. Take a bus, tourist shuttle, or walk to St. Barbara's church. Follow the church's exit out to explore the entire city -- it leads you directly into the town. There's a lot of cafes, restaurants, souvenir shopping, art museums, and the famous Kutna Hora underground mine tour. At the end of your city exploration, walk to the Kutná Hora Město (Kutná Hora Town Center) Train Station and head back to prague via a short "shuttle" train to Kutna Hora Hlavni Nádraží. Kostnice Ossuary  , Zamecka 127. ph 327 561 143. email [email protected] This impressive bone church, is better known as the Sedlec Ossuary. The beginning of its story date back to 1278, when Henry, the abbot of Sedlec was sent to the Holy Land. On returning, he brought soil from Golgotha and sprinkled it on the ground here. As a consequence, the burial ground was considered holy and became extremely popular. In 1511 a chapel was constructed to house the bones from abolished graves. The chapel is open to the public, and contains the bones of about 40000 people, arranged by František Rint in 1870. 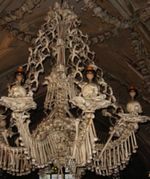 Rint's work includes an enormous chandelier including every bone in the body, and a crucifix style arrangement near the main altar. The ossuary is open 8am - 6pm (April - September), 9am - 5pm (October, March) and 9am - 4pm (November - February). Closed on 24th December. It is no longer closed 12-1 pm during the off season, though the nearby information center is. Admission is 60 Kč adults and 40 Kč students, though combination packages can be purchased to see other attractions more cheaply. The fee to take photos and videos has either been ended or is now merely ignored. The Church of Saint Barbara is located at the opposite end of the Kutná Hora's train station. If you wish to start your tour from there, you may want to get a taxi from the station to the Church and then walk your way around the town center. 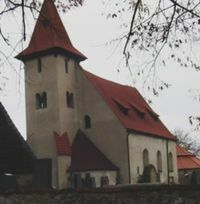 The works on the church started around 1380 by Peter Parler's workshop, whose other great work in the Czech Republic includes the imposing St. Vitus Cathedral at the Prague Castle. The eye-catching spires are really magnificent! If you're looking for some fantastic Gothic Bohemian style, St. Barbara Church is certainly one of them alongside St. Vitus in Prague (although as you might see it soon after Prague, it might not make the same impression as seeing Vitus, which is even more grand). Italian Courtyard, Royal Mint and former Royal Residence. Silver Mines, Flooded in the middle ages, tours of the accessible portions of the mines are provided daily, except for Mondays (usual closing day for sights in the Czech Republic). The mines are closed in winter (November–March). Hrádek, Czech museum of silver. Silver mines tours start here. Generally, the staff in restaurants around St. Barbara's Cathedral are friendlier and (oddly) more professional than in Prague. There are a number of bars, restaurants and cafes just underneath the shadow of the cathedral. Some provide a breathtaking view of the valley to the south. The best experience I have had personally was at the restaurant U Hrnčiře (By the Jug Maker's). The food is excellent with traditional Czech dishes alongside a surprising array of vegetarian dishes. Another choice is Pizeria Piazza Navona at Palackeho Square,which offers traditional (and original) Italian pizza and pasta and homemade tiramisu and panna-cota. There are also bus service to and from Prague, but trains seemed to be pretty reliable and ran on time. You can also take a cab back to Prague, which would cost you around 1600Kc. This page was last edited on 28 August 2017, at 19:13.